THE Federal Government needed to reaffirm its commitment to an agricultural visa – one which allows overseas workers onto Australian farms and into agricultural processing plants such as abattoirs – according to the Australian Meat Industry Council. 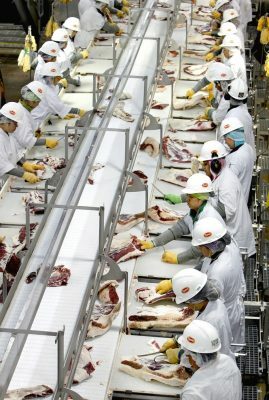 The council said an estimated shortage of 3000 employees in processing was a significant and pressing concern for the Australian red meat industry. AMIC chief executive Patrick Hutchinson said a lack of progress on greater access to visa workers was hurting the industry. “Sourcing appropriate labour is a major obstacle to further investment in meat processing in Australia,” Mr Hutchinson said. The Australian agribusiness sector was not just made up of farms and farmers, but was an entire supply chain that employs thousands of people and adds billions of dollars to the economy, Mr Hutchinson said. “We need to ensure the whole supply chain is thriving,” he said. Red meat processors like Fletcher International Exports in Dubbo have implemented extensive labour programs. They recruit local workers first but the region in which they operate has an unemployment rate of less than 3.5pc, so its a constant challenge. Like most plants, Fletchers requires the potential applicants to pass a pre-employment medical, which includes a drug and alcohol test, so the number of applicants is reduced. The company advertises regularly for potential new local workers and works with local employment services. Most skilled positions are filled with local workers, but it is the unskilled positions where there is the biggest need and the biggest turnover, the company said. “On behalf of our members we are calling on government to commit to confirming plans for agricultural visas soon,” Mr Hutchinson said. AMIC is the peak council representing meat retailers, processors and smallgoods manufacturers and is the only industry association representing the post-farmgate Australian meat industry. Large firms should not be able to employ foreign workers, whatever the visa, if small business in Australia is unable to do the same. That is uncompetitive. Secondly, if foreign workers are employed, they should be employed directly and not through labour hire companies, so that all entitlements are paid and their wages are not garnished for excesive rent or other ‘fees’ by dishonest agents. Full transparency with oversight by the Government should occur. If the employment system and standards we have in Australia make it too expensive to employ local labour, then fix that, don’t deny the problem and import foreign workers claiming no local labour is available. It is clear that foreign workers are cheaper than local for many shonky reasons – stop tap-dancing around the reality, it is an insult to everyone’s intelligence. There is a Labour Agreement in place for the meat industry under the 482 temporary Skilled Shortage visa that may help your situation. Perhaps Mr Hutchinson could let us know what percentage of workers in abattoirs are local employees and what percentage are from overseas on visas. Our understanding in many abattoirs the percentage of overseas workers on the kill floor and in the boning rooms is well above 80%.